Dixie Contract Carpet wins big at the 2012 annual ABC awards! Dixie was awarded the pyramid award for its outstanding installation at the historic building renovation at Farah and Farah in downtown Jacksonville. The architect was Dasher Hurst and the contractor was Danis Construction. Approach the newly renovated Farah and Farah building in downtown Jacksonville, Florida and you will be impressed with the “newness” of the exterior brick structure. Though still maintaining its original exterior design and historical aesthetic (all the bricks are the originals), it appears remarkably clean thanks to resurfacing that took place as part of the project. But enter the doors and BANG you are thrown fast forward into a cool, sleek modern interior that rivals any new contemporary interior designs built in modern day Jacksonville – even New York! However, look closely and you will recognize interior elements from the building’s historic past reminding you that this building is truly a long time resident to downtown Jacksonville. Marrying the historic building with its new interior “outfit” appears so seamless and gracefully balanced it could seem that it was easy to do. But like a prima ballerina, the design and construction teams had to utilize their years of experience and hard work in collaboration with the design team to make this tired beauty come fully alive again – and make it look easy. 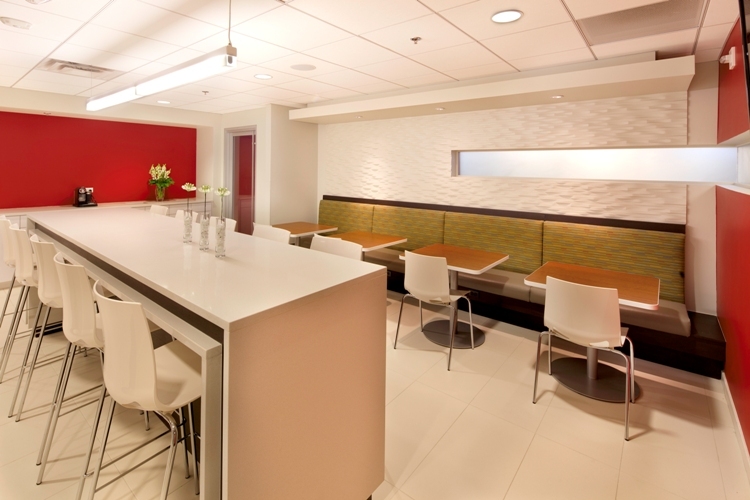 The Farah and Farah project was a renovation of the historic Kress building in downtown Jacksonville, Florida. 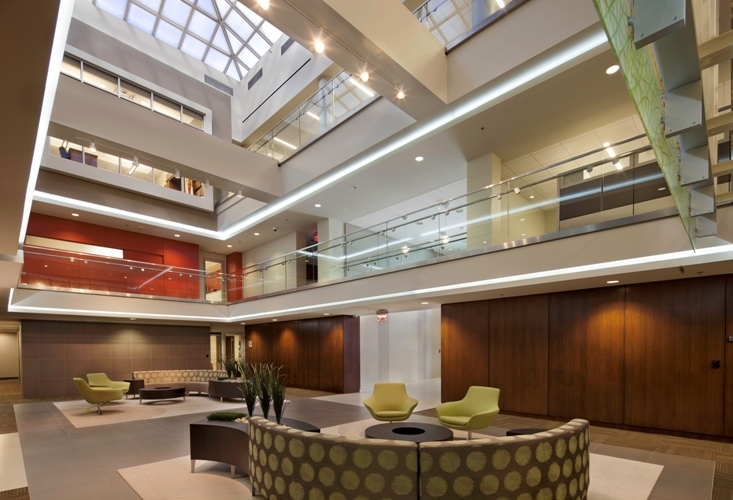 The project encompassed 38,000 sf of floor space in a 4 story building. The design team incorporated a modern approach to the flooring design in keeping with the new aesthetics, also marrying flooring elements with elements in the walls and ceiling. While in the end this made for a three dimensional experience of the spaces, it required the expert knowledge of the contractor and sub contractors in collaboration with the design team. From the point of entry, the tile design is expressed through multiple sizes and textures of tile on the floors and the walls. Grout lines in the tile became a design element stringing the reception space into the main lobby and reaching out into its adjacent spaces. Grout lines were designed to match with grout lines in the tile walls and reveals in the sheet rock walls and wood paneling. During the finalization of material selections - which were still going on during the construction of the project – our team worked with the design team to find the best carpet products to (1) fit the budget, and (2) be suitable for the owners and (3) be in stock so it could be delivered in time to meet the project schedules. The porcelain tile that was specified on the project became unavailable in time to meet the project deadlines so our specifications department assisted in securing similar tiles with same sizes and textures that would still be able to achieve the design intent and meet the project schedule. Our installation team even field cut several of the replacement tile types to customize them to fit the design of the job. During construction our project supervisor recognized early in the staging of the porcelain tile installation that the building was significantly out of square. This meant that where lines matched up in plan, they were not going to match in real life without SIGNIFICANT modifications. Our team met with the architect on several occasions to collaborate on adjustments to meet the challenge of the desired results. In review of the project photographs, the judges will notice the attention to detail required making all planes of this historic building connect into a congruous interior finish system. All finishes align in ways that make a large custom pattern of the entire interior of the building while respecting each material’s own pattern within its specific room. This is a sophisticated utilization of interior finishes that requires top craftsmen in each trade to pull off successfully. 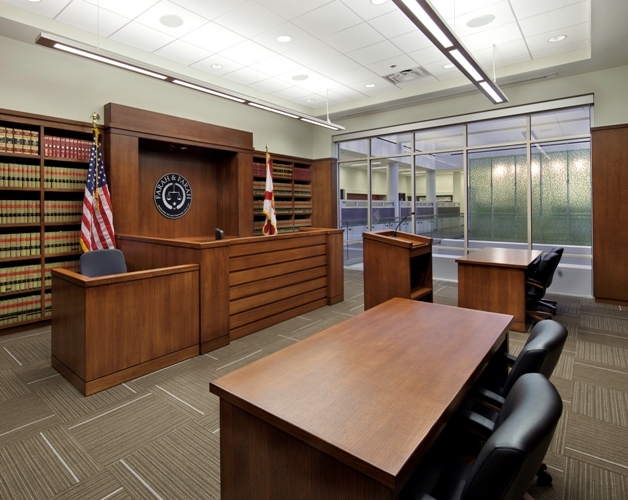 The Farah and Farah Law Offices historic renovation project is special because of its requirement to utilize a historic structure for a modern streamlined interior design system. 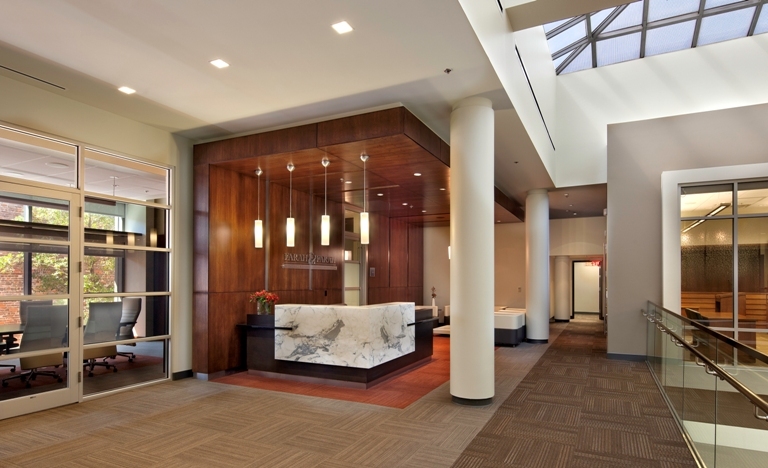 It qualifies for the ABC Excellence award for specialty contracting for interiors because of this challenge, which required EXCELLENCE from the flooring sub-contractor as well as TEAM COLLABORATION amongst all trades to complete successfully. The project’s success was proven when it was awarded a design award from the American Institute of Architects, Jacksonville Chapter in May of 2011.